Earlier this week we shared how today's consumers expect more -- much more -- from mobile sites. They told us so in our recent research survey, What Users Want Most From Mobile Sites Today. Today we'll share more results, with some great examples of businesses giving mobile users what they want. Whether you're a Fortune 500 company or the pizza shop down on the corner, creating a mobile-friendly site is a critical step: 67% of mobile users say that they’re more likely to buy a product or service from a mobile-friendly site, and 74% say they’re more likely to return to that site in the future. How are smart companies making mobile sites work for them? For their new mobile site, the flower retailer ProFlowers simplified things by highlighting the most popular bouquets to reduce scrolling, by trimming text, and by cutting checkout steps. How well has it worked? “Since becoming mobile-friendly, we’ve seen our mobile conversion rate jump by 20–30%," says Leif Heikkila, the company's senior director of online marketing. Download the case study. FragranceNet sells perfumes and colognes, yes, but also face creams, shampoos, eyeliner and more. For Michael Nadboy, the company's VP of online marketing and strategic development, the trick to mobile success was to show bigger product images and buttons, larger font sizes, and fewer images overall. Mobile users loved it: FragranceNet boosted mobile sales by 48% in just four months. Download the case study. Rock concerts, Broadway shows, NASCAR races: TicketNetwork’s mobile site helps on-the-go fans find tickets for them all. The company redesigned its mobile site with speed in mind, stripping away all non-essential content and graphics. They also trimmed steps from the checkout process to help mobile users buy fast. Four months after introducing the new mobile site, web traffic from mobile devices was up 120% and overall sales from mobile had grown by 184%. Download the case study. You can see the keys to mobile site success: big buttons and text, less content, fewer steps to checkout, and a focus on speed. Mobile Banking and Finance customers are most interested in checking account balances, transferring money and paying bills. 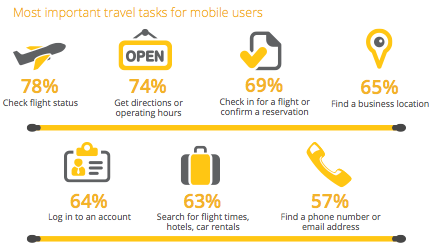 Mobile Travel customers are most interested in checking flight status and confirming reservations. Mobile Retail customers like to contact a store and find product information. Mobile Automotive customers are most interested in contacting the dealership and making service appointments. 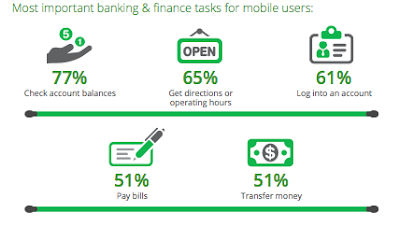 The bottom line: mobile users are ready to make choices on the go. Help them get there fast and you'll help your business grow. We reviewed these findings yesterday during our webinar: Mobilize your Site and Maximize your Advertising. If you missed it, please keep an eye out for the recorded webinar, which we'll post soon. In the meantime, check out howtogomo.com for more tips on how to build a mobile-friendly website.